Fig. 320, Fig. 321 and Fig. 324 Continuous Heaters are used to heat liquids quickly through direct contact with steam where a hot water under pressure is required. The liquid under pressure attains a high velocity passing through the nozzle. 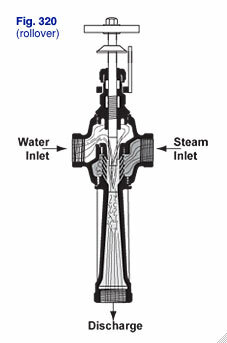 Steam enters through a series of nozzles in the combining tube and an intimate mixing of the liquid and steam occurs in the throat region. The liquid absorbs all of the heat of the steam. Under normal conditions no loss in water pressure occurs. In certain cases, this water can be operated against back pressures higher than either the supply water pressure or steam pressure. Fig. 320, Fig. 321 and Fig. 324 Continuous Heaters can eliminate mechanical pumps, resistance or bayonet heaters and containment vessels. 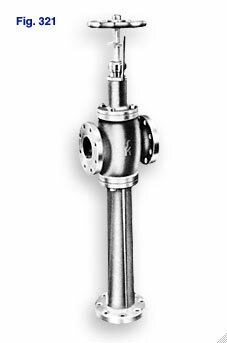 Continuous Heaters have the ability to attain discharge pressures in excess of either water or steam pressures due to momentary transfer between the two streams. These units have a low initial cost, limited moving parts and are easy to install and require little or no maintenance. The Instantaneous Heater is a special adaptation of the Continuous Heater. The Continuous Heater is used by many plants to supply hot water for washing floors and equipment. For more detailed information about Continuous Heaters, Bulletin 3A Literature. To submit a Request for Quote (RFQ) for Continuous Heaters, Adobe PDF or submit an online interactive RFQ Form for Pipeline Heaters.